This short piece on how simplifying is painful gets me right in the heart. These maple almonds with fleur de del speak to my 24/7 need for salty-sweet-healthy things in my life. Not only is Grace of Earthy Feast a total sweetheart (she called me her avocado princess the other day! ), she also makes amazing recipes like these chickpea crepes (that you can easily make GF). Shanna of Food Loves Writing figured out how to make einkorn cream puffs and THEY'RE SO EASY, YOU GUYS! Food52 is killin' it with 9 potato recipes for St. Patrick's day (including something called Wonder Fries I can't wait to try out). This recipe for vegan, gluten free cinnamon rolls is happening in my life (gonna go start proofing some yeast RIGHT now so I can have some cinnamon goodness for the snow day tomorrow). And, finally, this chocolate cinnamon pan bread -- designed to be topped with breakfasty things like yogurt and homemade nutella and bananas -- is calling my name. I get a lot of questions about tempeh on a day to day basis. How to cook it, what to eat it with... what the heck IS tempeh anyway? (It's a fermented soy cake packed with vitamin b12). Mostly, the questions come from friends who are trying to eat healthy -- or already are -- and are ready to try out some of the more esoteric health foods out there on the market. Tempeh just so happens to be one of the more palatable fermented health foods for those folks unaccustomed to fermented foods in general. It's rather plain, in fact. So plain that it's a problem. In fact, tempeh is a rather boring, bland food. Unless prepared properly. 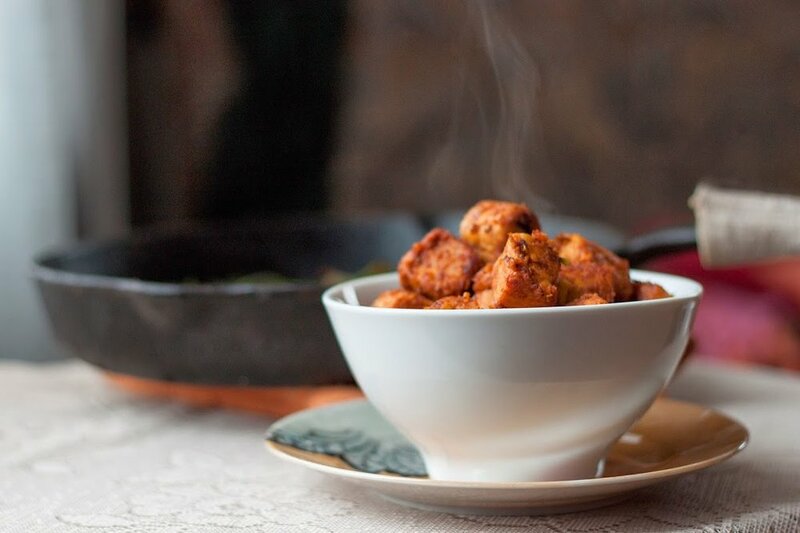 The key is to saturate mushroomy, bread-like tempeh with salty, savory, buttery flavor. It crisps up quite well, too. I like to cook it with wine and spices reminiscent of sausage (paprika, coriander... sometimes I add thyme, rosemary, black pepper). 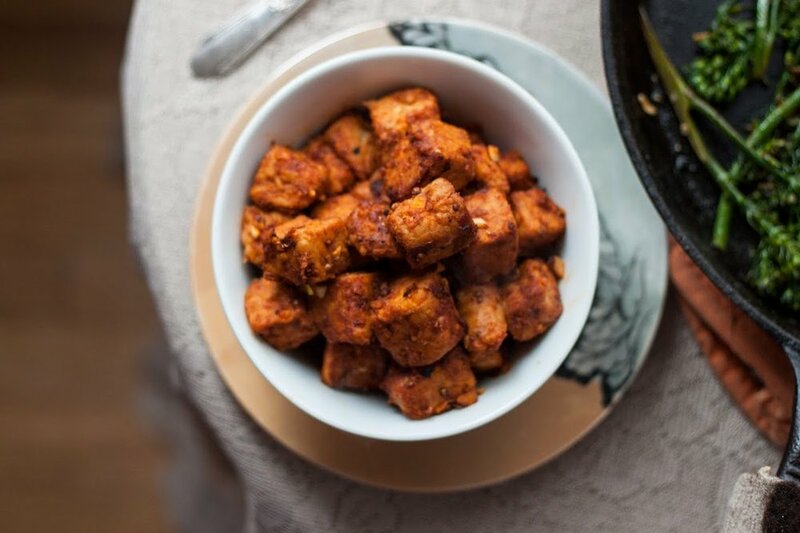 I often go for a smokey tempeh by adding chipotle or smoked paprika. Ultimately, this recipe is a baseline for cooking tempeh perfectly every time. Steam, add condiments and spices, cook down until crisp, serve. If you want to do a variation, keep the same proportions of oil, alcohol, vinegar/acid, tamari and mix up the spices. A simple mix of lemon juice, tamari, black pepper, and rosemary is great. In a large sautee pan placed over high heat, add tempeh and 1 cup water, and cover. Cook until water has evaporated (I usually remove the top when there's only about 1 cm of water left in the pan). Once the water has cooked off, add ghee, vermouth, vinegar, tamari, smoked and sweet paprika, and coriander. Cook down, stirring often, until all liquid has reduced and absorbed into the cubes of tempeh. Add simple syrup and garlic, and cook until crispy, about two minutes more. Serve hot with gai lan. 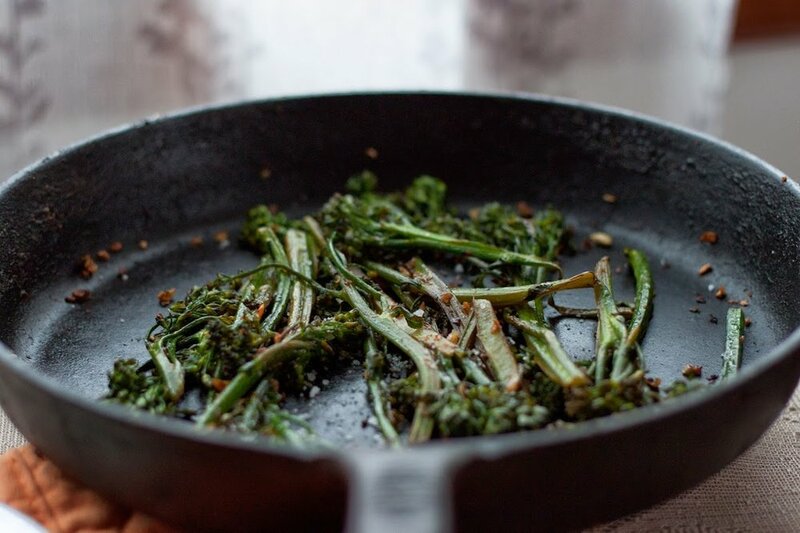 Place a large cast iron pan (or steel sauté pan) on medium-high heat. Once hot, add broccoli and 3 tbsp water, and cover. Let steam until all of the water has evaporated (this took me about 5 minutes). Remove cover, add ghee and garlic, and sauté 10 minutes more. Squeeze lemon over and add sea salt to taste. Serve hot.